The move to a nursing home or long-term care facility can be difficult. For those who have had to place a parent or loved one in a nursing home, this can be emotionally difficult. We expect the nursing home or long-term care facility to provide great care to our loved ones. This is especially the case with loved ones who may be suffering from dementia, cognitive brain disabilities, or other physical disabilities that may impair their ability to move and communicate. Tragically, residents of nursing homes and long-term care facilities are frequently the subject of injury due to abuse and neglect. Common injuries include broken bones from falls, bed sores, choking, and the effects of being given the wrong medication or being overly medicated. In almost all cases, these conditions and injuries could have been avoided due to proper care. include measurable objectives and timetables to meet the resident’s medical, nursing, and mental needs identified in the comprehensive assessment. The services provided under the plan of care are to attain or maintain the resident’s highest practicable physical, mental, and psychosocial well-being. In our experience, most injuries that occur as a result of the failure of the nursing home and its staff to follow the key aspects of a resident’s Plan of Care. For instance, residents suffer from fall injuries who should not have been permitted to walk unattended. Residents choke, and sometimes die, when they are given food that they cannot chew and swallow because of a variety of conditions that can affect their ability to swallow. 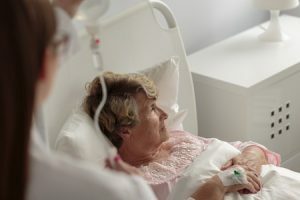 Bed sores, a commonly-seen injury in nursing homes, are usually the result of the failure of nursing home staff to properly care for individuals who need to be turned in bed. It’s important to understand exactly what happened so that a determination of legal negligence can be ascertained. To make a determination of whether negligence may have occurred, it is important that we obtain all records relating to a patient and to have these records reviewed by a medical professional in order to get their opinion regarding what treatment and care should have been provided. When abuse and neglect has occurred, in many instances the nursing home will try to blame others for their failure. Those blamed can include the families of the residents. Listen to your loved one. Do they complain about their treatment? Ask them about aspects such as how often they are being bathed. Look at your loved one. Do you see any bruising or other physical marks? Do they seem to be bathed and have their hygiene needs met? Watch their reactions around staff. Do they seem to be in fear of any care providers? Pay attention to the surroundings. Does it smell badly, like residents are not being cared for properly? Are rooms kept clean? Does your love one seem to be properly coherent given their condition? While many residents are suffering from cognitive issues, in some cases, their mental status may be affected by being over-medicated or not being given the proper medicine and dosage. Do You Suspect Your Loved One has Suffered From Abuse and/or Neglect? In most cases of injury, abuse, and neglect in nursing homes, the only protection available to residents is the advocacy provided by their family, and in turn, by legal counsel. Nursing homes and staff will have a natural inclination to cover up injury and abuse in order to protect their own interests. Please call us today to get started. We provide contingency fee representation (no fee unless you win) and a free, no obligation consultation so that you can learn about us and we can learn about your loved one’s case.